While the option to store frames temporarily on the hard disk is a good idea, this feature could be improved upon. CTRL + S could, for example, bring up a window that says Save Project As… (type name and click Save) and automatically save all of the frames in a folder within My Documents called My GifCam Projects. That folder would contain a sub-folder that contains individual projects with the date. Ex. IsaGifFun2 July 23, 2014 would be the folder. Frames for that specific animation would be stored within for easy retrieval. Thank you for mentioning Nvidia ShadowPlay I didn’t know about it. You are very welcome! ShadowPlay is pretty awesome. It has the ability to do what many video capture programs achieve. The beautiful thing is that the software utilizes a hardware H.264 encoder built onto the Kepler-based GPU, which reduces system overhead. This leads to about a 5% performance decrease when in use compared to something like FRAPs, which can drop your frame rate by about 50% when using a mechanical storage device. 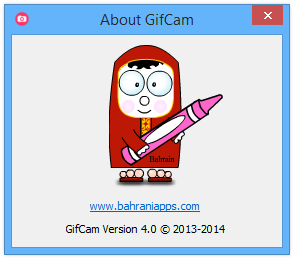 The option “Capture Cursor ” is not remembered when restarting gifcam. Thanks :), currently user settings are not saved, maybe in the future. How do I open the keyboard inputs window? I wasn’t exactly sure where I should ask a question about one of the issues I am having so I decided to post it here. My problem stems from the green screen in GIF Cam. When I save the GIF and open it, the GIF plays fine. However whenever I open it up on Photoshop the green screen deteriorates the image up until there is some sort of checkerboard where the green screen appeared. What is causing this problem and how can I fix it? You can disable green screen by pressing shift + save button, better thing is to export you record as AVI then import it in Photoshop in this way you will not lose the frames quality. I’ve used 3.5 and have now downloaded 4.0. GifCam is a great idea and a powerful implementation … but it’s hampered by a total lack of instructions on how to use individual features … like change the transparency color or edit using the keyboard. ►How do I open the keyboard inputs window? ►How do I change the transparency color from green to orange? ►What does the Custom setting do? Thank you for mentioning that, I’m thinking to write a guide document with FAQ by taking the most frequently asked questions and put it in a guide document, maybe a PDF document is good because it can have gif files inside it. Can you tell me these answers, for now? Hey, version 4.0 is really great! Keep up the good work! The “custom” color complexity density slider is by far the most useful. I use GifCam quite often, especially for Tumblr. The thing is, Tumblr is very picky about the pixel and data sizes for GIFs to play. Could you include two very minor changes in the next version please? >Is there a way the pixel size could be included in the same window when resizing, rather than just the percentage? >Lastly, when a GIF is previewed, it shows the KB, MB, etc size. Could the indicator please be changed to show the full size, ie. “1365 KB” or “15.4 MB”, and not “1.3E3MB” or 1.5E4 MB as it currently only displays an arithmetic format in powers of 10. >for more accurate resizing, type your desired size in “keyboard input” window. >”powers of 10″ has been fixed in version 4.5.